To feed on blood; such as, vampire bats, mosquitoes, leeches, ticks, fleas, etc. 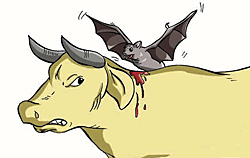 A vampire bat is getting its sanguivorous meal from a cow. Absorbing nutrients from dead or decaying organic matter. Eating or feeding on seeds. A reference to certain insects that eat dung or excrement. 1. The eating of just one kind of food or eating just once a day. 2. A reference to a host-specific parasite. Those who consume or devour words: "The student claimed that she was a verbivore because she was continuously looking for more words to add to her lists." Feeding or eating worms, grubs, or insect vermin; said especially of certain birds.